Harinam Mela in Oslo 29th Sept. - 1th Oct. 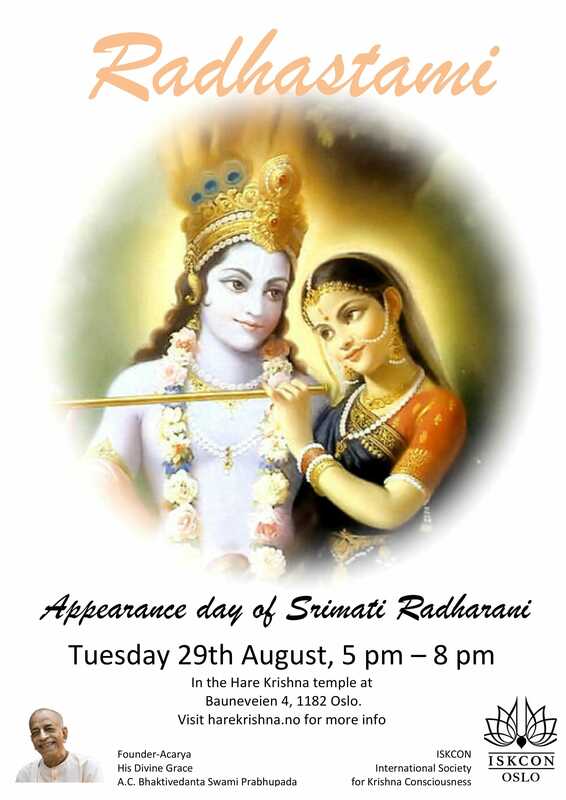 Please join celebrating Srimate Radharani's appearance day, Tuesday 29th of August from 17:00 till 20:00, with kirtana, lecture and prasadam! This song was sung by Rūpa Gosvāmī. He is the real person, actual person, to understand Rādhā and Kṛṣṇa. So he says, "All glories to Rādhārāṇī." Rādhe jaya jaya mādhava-dayite. "She's so dear to Kṛṣṇa." Kṛṣṇa, everyone is trying to love Kṛṣṇa, but Kṛṣṇa is trying to love somebody. Now how great She is. Just try to understand. Everyone, the whole world, the whole universe, all living entities, they are trying to love Kṛṣṇa. Kṛṣṇa-prema. Lord Caitanya describes, prema-pumārtho mahān. 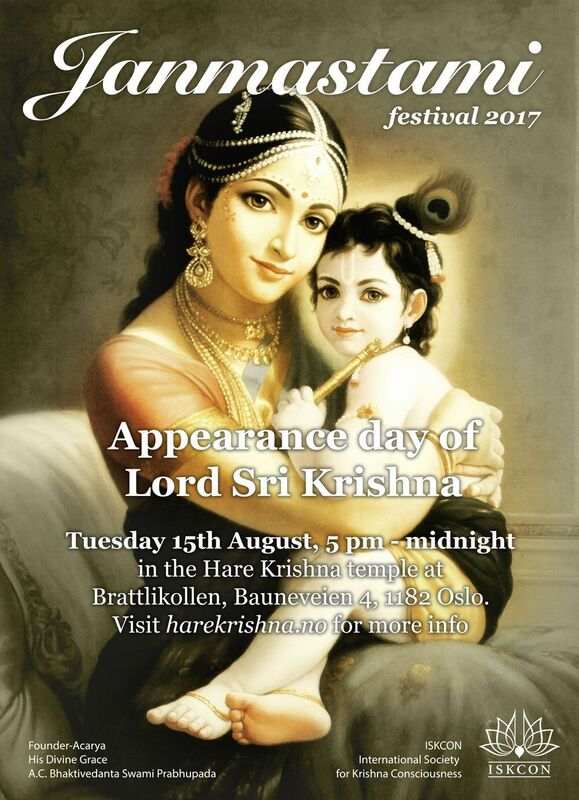 And Rūpa Gosvāmī described that "You are distributing kṛṣṇa-prema." So kṛṣṇa-prema is so valuable, but Kṛṣṇa is after Rādhārāṇī. Just see how Rādhārāṇī is great. Just try to understand the greatness of Rādhārāṇī. Therefore She is so great, and we have to offer our respect. Rādhe jaya jaya madhava-dayite. How She is? Gokula-taruṇī-maṇḍala-mahite. Taruṇī, taruṇī means young girls. You'll see the pictures, they are all young girls. But of all the young girls, She is the most beautiful. She is enchanting to the young girls also. She is so beautiful. Gokula-taruṇī-maṇḍala-mahite. Dāmodara-rati-vardhana-veśe. And She always dresses Her so nicely that Dāmodara, Kṛṣṇa, becomes attracted by Her beauty. Hari-niṣkuta-vṛndā-vipineśe. And She is the only lovable object of Kṛṣṇa, and She is the queen of Vṛndāvana. This queen of Vṛndāvana... You'll find in Vṛndāvana, if you go to Vṛndāvana, everyone is worshiping Rādhārāṇī. Rāṇī means queen. They are always speaking, "Jaya Rādhe!" Rādhārāṇī. All the devotees in Vṛndāvana, they are worshiper of Rādhārāṇī. Hari-niṣkuta-vṛndā-vipineśe. Vṛṣabhānudadhi-nava-śaśi-lekhe. And She appeared as the daughter of King Vṛṣabhānu, and Her companion, Lalitā-sakhī and Viśākha-sakhī, and the devotees... So on behalf of the pure devotees of Kṛṣṇa, Rūpa Gosvāmī is praying, karuṇāṁ kuru mayi karuṇā-bharite. "Oh, my worshipable Rādhārāṇī, You are full of mercy. So I am begging of Your mercy because You are so merciful, very easily You offer, bestow Your mercy. So I am begging Your mercy." Karuṇāṁ kuru mayi karuṇā-bharite, sanaka-sanātana-varṇita-carite. Now somebody may say, "Oh, you are so great, learned scholar, you are so great saintly person, and you are begging mercy from an ordinary girl? How is that?" Therefore Rūpa Gosvāmī says, "Oh, this is not ordinary girl." Sanaka-sanātana-varṇita-carite. "This girl's description is possible to be made by great saintly persons like Sanaka-Sanātana. She is not ordinary." So the lesson is that we should not treat Rādhārāṇī as ordinary girl, or Kṛṣṇa as ordinary man. They are the Supreme Absolute Truth. 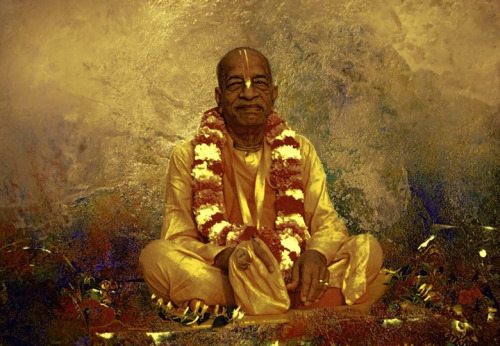 But in the Absolute Truth, there is the pleasure potency, and that is exhibited in the dealings of Rādhā and Kṛṣṇa. And Rādhā's expansion all the gopīs, and Kṛṣṇa is the Supreme Lord.